Good news! Small bathrooms don’t have to be that dreaded room in the house. With a few quick tricks and smart tactics, that crowded space of your bathroom will feel extra luxurious! Also, a tiny bathroom means a smaller expense, so it is not such a hit on your wallet to renovate it every once in a while. Not one that swings into the bathroom, taking up unnecessary space. Opt for an option like a sliding door on hinges. It’s a cute and unique way to add a bit of flair to the house! Built-in vanities often take up too much space. However, a vintage, leggy piece of furniture offers a spacious alternative to the standard bulky countertops. And tone genre – even the ceiling! For splashes of color, pick accessories and sneaky storage spaces, like gluing colored paper to the bottom of a pullout drawer. For smooth transitions between tile, floor, and walls, use similar colors, maybe a shade or two off. 4. Plenty of natural light is a necessity! Don’t block any windows, and strategically place mirrors (lots or mirrors!) around the room for an illusion of a giant space. This is a great idea since a closed-off shower crams the room. However, a swinging door cramps the small room even further. Choose a shower curtain, a sliding door, or our favorite – a half-glass panel. is key to preventing clutter in a tight bathroom. Hang baskets on the wall, build floating shelves, and store as much as you can high up the wall, off of the floor! as many edges as you can for an easy navigation through the bathroom. Bruised shins are painful, and rounded sinks or counter are a great way to utilize the small space efficiently. 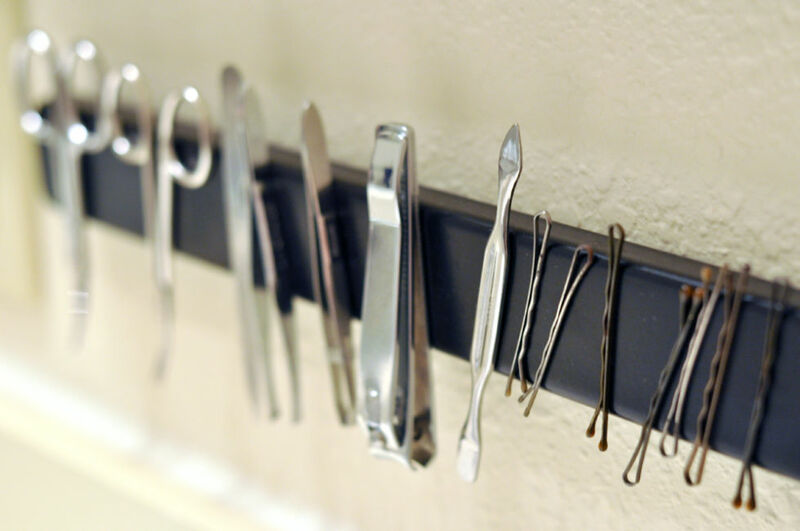 To keep bobby pins and other metal things off of the counter. Why didn’t we think of that sooner? Instead, place them above the sink, on the door or above the toilet! 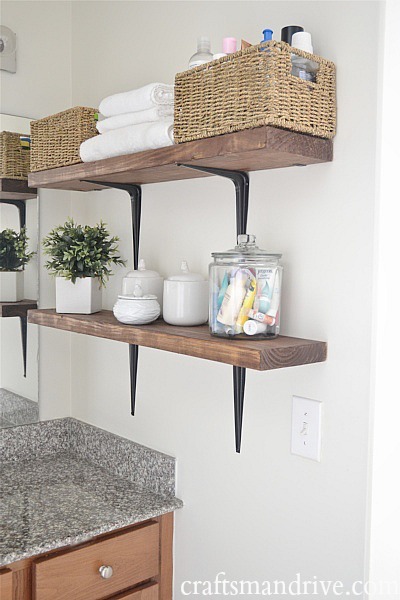 Speaking of above the toilet, why not install a short floating shelf? It won’t get in your way, and is a convenient option for keeping things uncluttered. 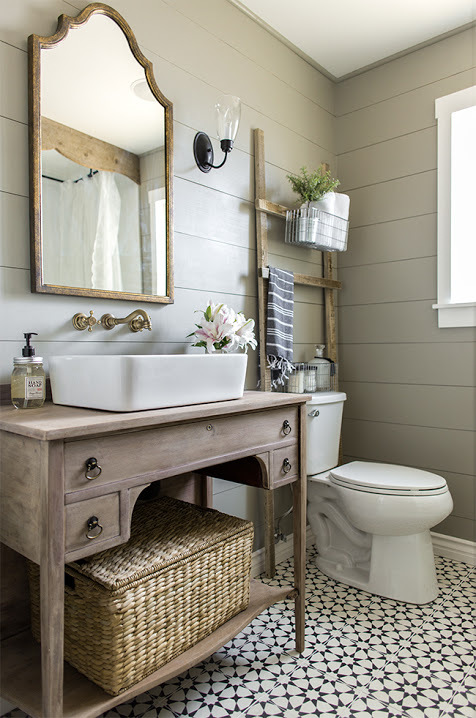 Design an eye-catching floor with solid walls, or use the small bathroom space for a fun creation. Where else in the house can you pull off such bizarre art? Whatever you choose, know that your small bathroom can be incredibly luxurious with the help of some hard work, loving care, and a few handy hints.